With most British brides wearing engagement rings that have a 0.5 to 1 carat diamond, the news that the world’s largest diamond will go on sale makes me think of photographing a future bride wearing a ring so big the Bridal party consists mainly of heavily armed personal bodyguards. 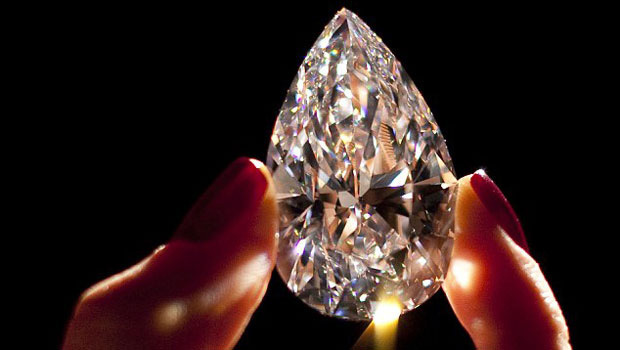 The big, blingy beauty is an astonishing 101.73 carats and is from Botswana. It will go on sale in May at Christie’s and is twice the size of the last largest diamond to be sold, which went for $9.4 million dollars. I'll take two thanks! If you’re thinking what I’m thinking, then yes the new owners of this diamond are most likely to be millionaire celebs or oil barons. I haven’t (as yet!) photographed a happy couple in Wales or the South West soon with a diamond engagement ring of that size maybe if we strike oil in Blaenavon then things will change. I see all kinds of engagement and wedding rings in my job, some have been large others small and delicate. You have to go with what suits you as a couple and what the bride will want to wear for the rest of her life. Does the size of the diamond matter? No, not in my opinion and in my experience of photographing almost a hundred weddings it’s the intention behind giving the ring and what it symbolises that counts. I’ve heard lovely stories of grooms saving hard to buy the perfect ring for their future wife to be, rings passed down through generations that have a wonderful history attached to them, and yes I’ve seen a few large rocks, but I’ve seen a lot more small, but perfectly sized ones that bring just as much pleasure to their happy owners and have a great tale of that very special moment they were given behind them.